Fox News host Bill O'Reilly slammed the Mother Jones journalist, who accused him of lying about reporting from the Falklands War. O'Reilly's former colleague, Eric Engberg, also added fuel to the fire, saying O'Reilly "behaved unprofessionally." O'Reilly, 65, used a whole 10-minute segment of his Friday episode of the O'Reilly Factor to tear Corn apart for the article at the left-leaning magazine Mother Jones that features investigative and breaking news reporting. The dispute came just a week after NBC news anchor Brian Williams took himself off air for lying about his time in Iraq. O'Reilly, a former CBS News reporter, pointed out: "Mother Jones, which has low circulation, is considered by many the bottom rung of journalism in America. However, in this internet age, the defamation they put forth gets exposure." "And so I have to deal with this garbage tonight. I'm sorry," he added, calling Corn "an irresponsible guttersnipe." Mother Jones alleged in its report by David Corn and Daniel Schulman on Thursday that "for years, O'Reilly has recounted dramatic stories about his own war reporting that don't withstand scrutiny—even claiming he acted heroically in a war zone that he apparently never set foot in." He said that after learning of the surrender [Argentina's to Great Britain], "angry mobs in Buenos Aires stormed the presidential palace, the Casa Rosasa, trying to overthrow the government of General Leopoldo Galtieri." "I was in the street with my camera crews," O'Reilly recalled, adding that "violence was horrific, as Argentine soldiers fired into the crowds, who were responding with violent acts of their own." According to O'Reilly, his video of the combat led the CBS Evening News with Dan Rather that night. Later, he sent a report that ran nationwide. To prove his words he showed an internal memo from CBS News praising his coverage of the protest. The trust and credibility that O'Reilly hasn't even remotely come close to building up over the course of his career is gone. "I never said I was on the Falkland Islands, as Corn purports, I said I covered the Falklands War, which I did," the Fox News host said. "Somewhere it has been reported that O'Reilly has claimed he was the only CBS News reporter who had the courage to go into the street because the rest of us were hiding in our hotel," Engberg wrote. “If he said such a thing, it is an absolute lie,” Engberg wrote. “Everyone was working in the street that night, the crews exhibiting their usual courage. O'Reilly was the one person who behaved unprofessionally and without regard for the safety of the camera crew he was leading,” he added. “This account from a veteran CBS News correspondent and a former colleague of O’Reilly - who witnessed O'Reilly's short stint in Buenos Aires at the end of the Falklands War - is additional confirmation of what we reported and raises additional questions for O’Reilly,” Mother Jones' Corn told The Huffington Post. 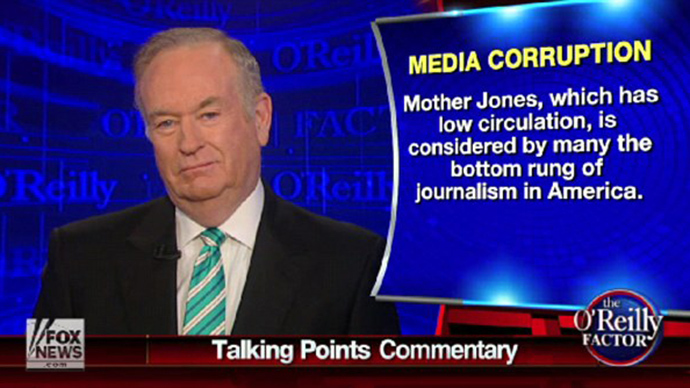 O'Reilly told TVNews on Thursday that Corn belongs "in the kill zone," for which Mother Jones demanded an apology. O'Reilly explained his phrase was "simply a slang expression."